You may be training for an upcoming race this spring/summer in Chicago and as you were training, you may have seen someone wearing brightly or otherwise, dull, colored tape on an exposed part of their body. You probably figured that the tape was helping them in some capacity with an injury they are working through in their training. What you may not have understood is how the tape works. Kinesio® tape was the original maker of soft tissue supportive tape despite other competitors on the market such as Rock Tape and KT Tape. The back story on how Kinesio® tape started dates back to 1979 by Dr. Kenzo Kase, a chiropractor based in New Mexico. His goal was to improve patient care and the tape he developed aimed to reduce pain and discomfort while also improving circulation and blood flow in the body region affected. Over the years, Kinesio® tape has adapted and advanced to help patients of all populations (weekend warriors, elite athletes, pregnant women, and recreational athletes, to name a few) to move better and provide support for affected areas where circulation, pain, and function are altered. The tape when applied correctly by a certified Kinesio® taping practitioner (CKTP®), allow for and assist normal circulation/lymphatic flow, normal muscle function, remodeling of dense connective tissue (known as fascia), and better joint balance. Kinesio® tape providers tape their patients in numerous ways to support the following tissues: joint, muscles, ligaments and for swelling of a tissue to name a few. The tape is made of an acrylic glue that is generally comfortable on the skin and is known to be water-resistant, not waterproof. Factors such as humidity, sweating, skin type (oily vs. dry) can influence the tape’s ability to remain on the skin (it normally lasts 3-5 days, but it varies on a patient-by-patient basis). Kinesio® tape will provide support and benefit during activity as well as when sedentary. Due to its wide array of colors, it allows athletes to stand out when competing/staying active. 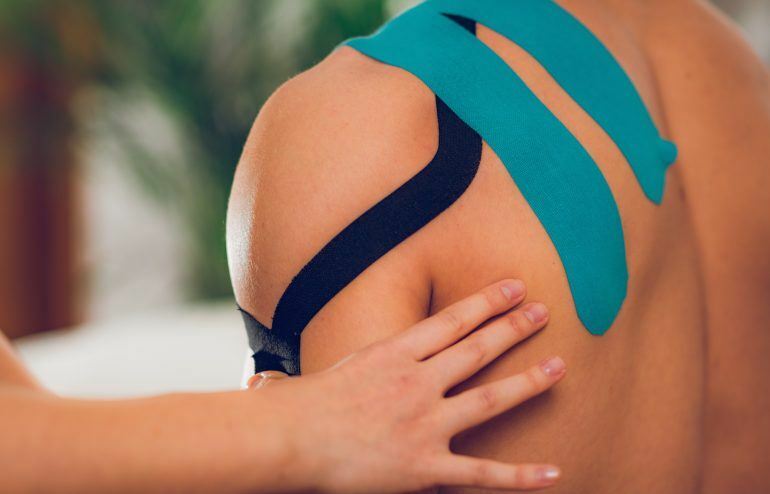 It should be noted that Kinesio® tape is not going to fix the problem, but it should help the injury or injuries because of the support it provides. The next time you go out and you want more support while you exercise and/or train, consider Kinesio® taping for an added advantage!